Disclosed herein are vitrectomy probes configured for use with optical coherence tomography. 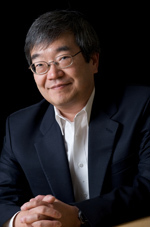 James Fujimoto is Elihu Thomson Professor of Electrical Engineering and Computer Science at the Massachusetts Institute of Technology, visiting professor of ophthalmology at Tufts University School of Medicine, and adjunct professor at the Medical University of Vienna. His group and collaborators invented and developed OCT, and he co-founded Advanced Ophthalmic Devices and LightLab Imaging, which developed cardiovascular OCT. He has published over 450 peer-reviewed articles and co-edited 13 books. He is a director of the International Society for Optics and Photonics (SPIE) and general co-chair of the SPIE BIOS symposium, and previously was co-chair of two Conferences on Lasers and Electro Optics and the European Conference on Biomedical Optics, and director of the Optical Society (OSA). He has received the Zeiss Research Award, IEEE Photonics Award, and OSA Ives Medal, and he shared the 2002 Rank Prize in Optoelectronics and 2012 António Champalimaud Vision Prize. He is a member of the National Academy of Engineering, National Academy of Sciences, and American Academy of Arts and Sciences. Rox and I would like to take this opportunity to thank SPIE, program track chairs, conference chairs, and all of you in the com¬munity for the opportunity and the privilege to serve as co-chairs of BiOS all these years. The development of OCT in the early 1990s greatly benefited from components and methods used in fiber-optical communications...And still, 25 years later, advances in the optical communications industry continue to greatly benefit OCT.
Our study demonstrates world-record results in cubic meter volume imaging, with at least an order of magnitude larger depth range and volume compared to previous demonstrations of three-dimensional OCT...These results provide a proof-of-principle demonstration for using OCT in this new regime...Long-range OCT is a new range of operation that requires extremely high performance light sources, integrated optical receivers and signal processing. "The development of OCT in the early 1990s greatly benefited from components and methods used in fiber optical communications,. And still, 25 years later, advances in the optical communications industry continue to greatly benefit OCT. The newest swept-source OCT has the advantage that the light source frequency sweep range and repetition rate can be adjusted to tailor the resolution, imaging range, and axial scan repetition rate for the specific imaging application. We are now approaching a point with OCT where ophthalmologists have a view of the retina that is similar to that of pathologists...In the future, functional imaging will make subtle changes in pathology more measurable, and these advances will enhance sensitivity when monitoring disease progression and response to therapy. Hand-held instruments can enable screening a wider population outside the traditional points of care...The hand-held platform allows the diagnosis or screening to be performed in a much wider range of settings...Developing screening methods that are accessible to the larger population could significantly reduce unnecessary vision loss. Hand-held instruments can enable screening a wider population outside the traditional points of care. The hand-held platform allows the diagnosis or screening to be performed in a much wider range of settings. Partnership between academics and industry was critical for the development of OCT and is a powerful approach for translating new scientific discoveries into real world clinical practice...Clinical researchers on our team as well as other clinicians at leading international medical centers worked with the early OCT technology, exploring new clinical applications and blazing a trail that the broader clinical community could follow. This interdisciplinary approach was key to the success of this technology.